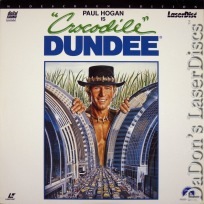 Crocodile Dundee 1986 - 98 min. 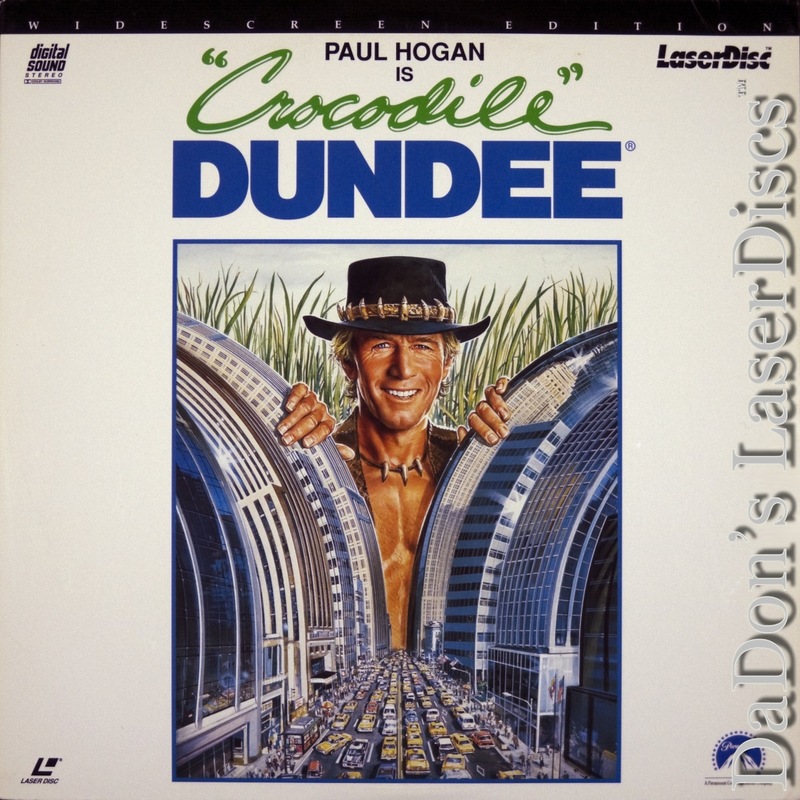 - Color Genre: Comedy Rated PG-13 Country: USA LaserDisc Movie Storyline: Sue Charlton (Linda Kozlowski), a reporter for Newsday, travels Down Under to write a feature on Australia and its people. She gets a tip to visit a free-spirited bush ranger who was attacked by a crocodile, which he then killed with his bare hands. So Sue heads into the red sands and squalid swamps of Northern Territory outback to a tiny fly-blown burg called Walkabout Creek, where she is greeted by Wally (John Meillon) of Never-Never Safaris. Wally takes her to the pub to meet the infamous Michael J. "Crocodile" "Mick" Dundee (Paul Hogan), who charms her with his swagger and grit. He offers to lead her though the bush, as she's "just a Sheila," to where he was attacked. This comment raises her city-girl feminist hackles and she strikes out alone. But when Mick saves her from the grasp of a toothy reptile, she ducks under his wing and into his heart, and invites him to return with her to New York City. Here in the sophisticated urban jungles of Manhattan, the bushman has finally met his match, as he endures New York streets of the 1980s, filled with drug dealers, muggers, transvestites, and prostitutes. Sue finally gets more than just a story as the "wonder from down under" rocks the Big Apple to its core. 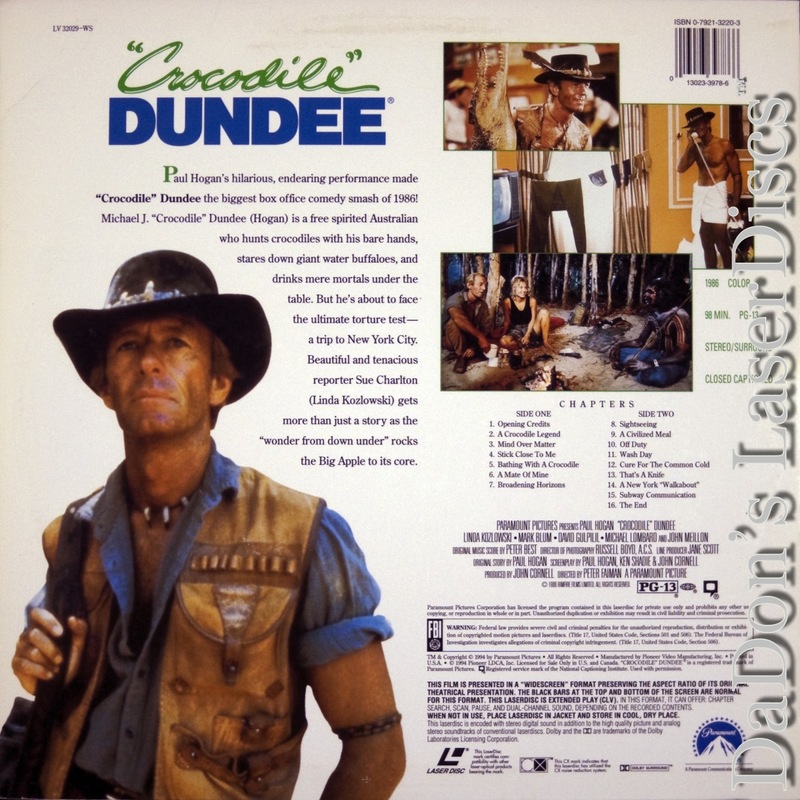 LaserDisc Movie Review: Aussie croc wrangler Mick Dundee (Paul Hogan) is starting to adjust to his crazy new surroundings in New York City with his beautiful new "sheila" Sue Charlton (Linda Kozlowski) when they accidentally get on the bad side of a ruthless drug lord. Their trouble starts when Sue's old flame Bob (Dennis Boutsikaris) is murdered in Colombia for taking pictures of an assassination by drug smugglers. Having sent the photos to Sue, she and Mick are suddenly and inadvertently mixed up in his unfinished business, as the DEA and drug cartel henchman come looking for the film. The urban terrain of New York, however, is no place for the outdoorsy "Croc" and his posse to hide out. So they hightail to for the Australian outback--a place infinitely more familiar to Mick--and even the odds by leading the big city hoods into a rugged landscape where they get a fast, funny and deadly lesson in wilderness survival. Much more an adventure thriller than the "stranger in a strange land" comedy of the first, Mick is still quick with the drawling one-liners, and the obvious warmth between real-life partners Hogan and Kozlowski adds to the fun. Thanks for Visiting DaDon's Rare LaserDiscs ! Reviews, Articles, Newsletter and Information for Movies on LaserDisc LD Laser Disc, LazerDisc.